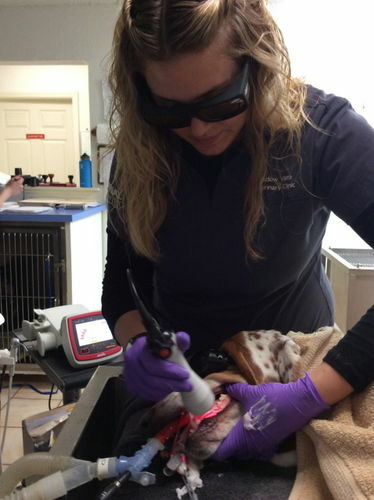 Meadow Vista Veterinary Clinic is excited to offer our clients Companion Laser Therapy. Laser therapy provides a non-invasive, pain-free, surgery-free, drug-free treatment which is used to treat a variety of conditions and can be performed in conjunction with existing treatment protocols. 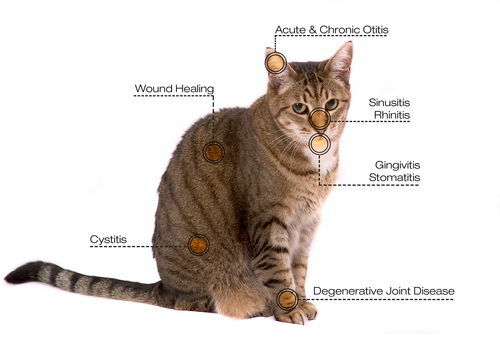 Relief and/or improvement is often noticed within hours depending on the condition and your pet's unique health status. Whether your pet is rehabilitating from trauma or injury, healing from wounds, or simply aging, your companion can benefit from this innovative approach to treating pain. Laser therapy stimulates the body to heal from within. Non-thermal photons of light are administered to the body fro about 3 to 8 minutes and absorbed by the injured cells. The cells are then stimulated and respond with higher rate of metabolism. This result in relief from pain, increased circulation, reduced inflammation, and an acceleration of the healing process. 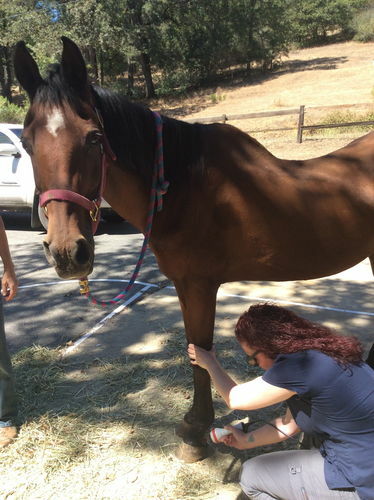 For large animal Companion Laser Therapy, click here. Gizmo can be a difficult dog to deal with at 14 years old and he had surgery for a torn ligament about 5 years ago. After his surgery he has trouble with his hip and he has a slipped disc. 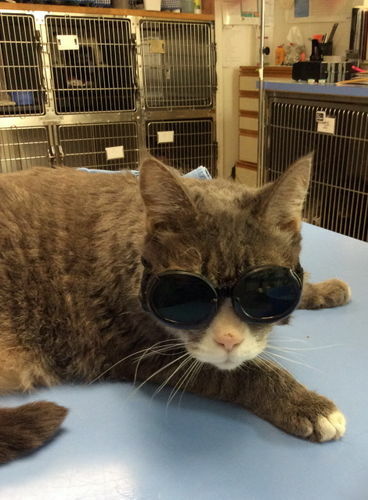 Dr. Joe suggested trying laser therapy, and it has worked wonders for Gizmo. He moves much better, seems happier and can get right up after laying in his bed. He is a much happier dog!! I would recommend anyone to try it for their pet. We love this vet . We recently moved here and are so glad we found them. It actually seemed to work quite well. She seems to be in less pain, and "limp" has improved greatly. Would highly recommend. As Nala is getting older her mobility had decreased due to decreased hip movement. 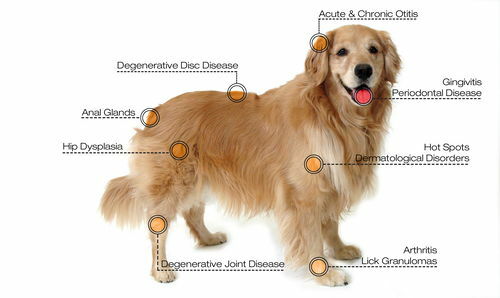 The laser therapy has given her better movement and less pain with her everyday functions. Nala looks forward to her laser therapy visits and will continue as needed for a more comfortable life as we all would like. 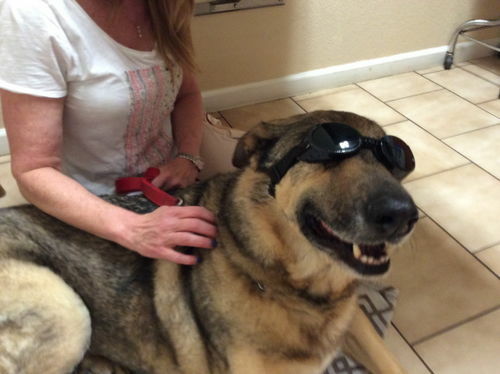 Kodi has been doing laser therapy for 10 months and it seems to help his mobility and pain level. He is less grump and this therapy seems to help with his difficulty in getting to his feet. The staff makes it easy to set up and keep appointments.